Thank you for visiting PurrForm, specialists in feline raw cat food and nutrition.Here at PurrForm we feel that all our cat companions deserve a varied mixed diet of fresh ingredients that create healthy, happy pets and satisfied cat owners. ‘Our mission is to spread the word about natural complete raw feeding to all cat owners across the UK. We feel it is vital that you are provided with the key information you need to establish what to feed your pets’. We believe that the benefits of a natural complete Raw cat food meat and bone diet far outweighs those associated with cooked and dry food. It is now widely accepted by many animal and veterinary professionals around the world that a raw food diet can have many health benefits over processed food. 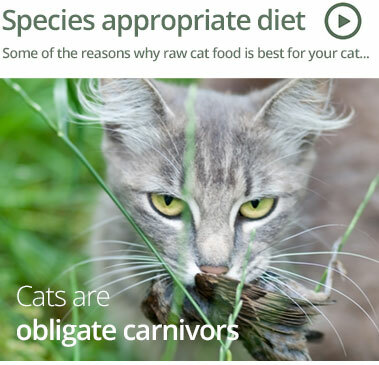 Your cat is able to digest and utilise the ingredients in raw food as this replicates what it would eat in the wild. show your pet how much you care”!